Minnesota may have a new all-time fishing record Wednesday. Darren Troseth pulled a 78-inch sturgeon out of the ice on the St. Croix River Saturday, 5 inches longer than the current state catch-and-release record set last year. "If confirmed it'll be the biggest fish ever caught, documented, in the state, so it's pretty cool," Troseth told MPR News Wednesday morning. "This fish here surpasses everything, even the old catch-and-keep record." He estimated it weighed about 120 pounds and may have been 70 years old. The catch and keep record maintained by the Minnesota Department of Natural Resources lists a 94-pound sturgeon as the biggest "certified weight" fish. He has submitted photos of his catch and measurements to the DNR and is awaiting word of a confirmation, which he thinks may come as soon as Wednesday. He has posted a video of catching and landing the fish on YouTube. Troseth, from Jordan, Minn., is no stranger to monster fish. He held a catch-and-release record a few years ago, and calls the pursuit of monster fish his passion. "As a guy that's caught a lot of these, I've seen many big ones," he said of the fish that took his hook on Saturday. "As soon as it appeared the first time, below the hole, my jaw dropped. I'd never seen anything that big before. I knew we were going to have to drill more holes." "Obviously, fish like this aren't a dime a dozen," said Troseth, who was out fishing with his friend John Kimble, of Prior Lake, Minn. They had been out on the ice for about three hours on Saturday when the monster bit. 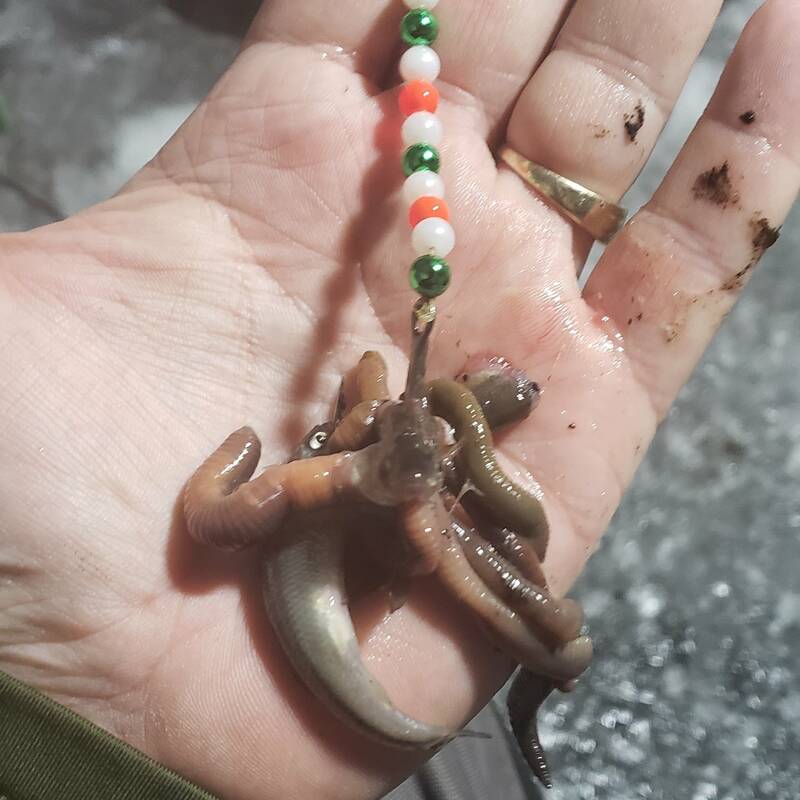 Troseth said he was using fathead minnows and nightcrawlers as bait when he hooked the monster. Kimble wound up reaching down, all the way to his shoulders, into the icy water to grab the fish so the two of them could hoist it out of the river. "I might be done ice fishing," Troseth said on the video, after he and his fishing companions slipped the monster back into the water and it swam away. "I don't know if I want to experience that again. That was awesome." 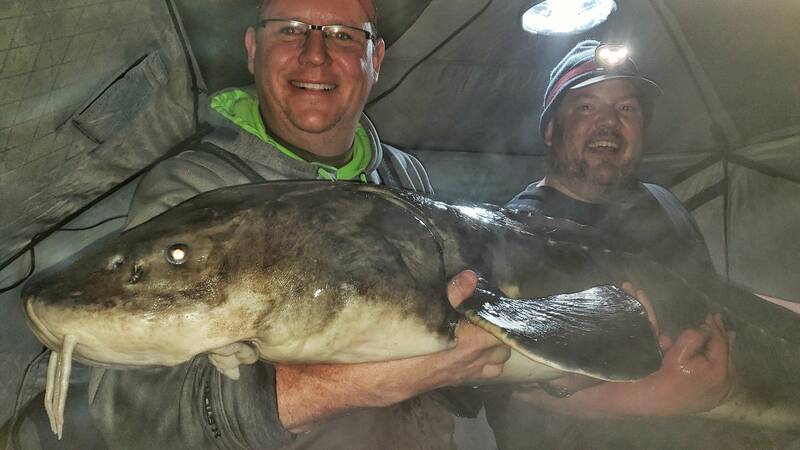 In an email to MPR News Friday, DNR official Shannon Fisher said "fisheries staff and conservation officers concluded that Mr. Troseth's sturgeon qualifies to be certified as a new Lake Sturgeon Catch-and-Release State Record." Troseth credits the agency for managing sturgeon fishing on the St. Croix to keep a monster that size in Minnesota waters. A catch-and-release season on the rivers has only been open since 2015. "The St. Croix River is a great fishery," Troseth said. "It's a real gem."